It’s here again; welcome back for #TokuTuesday! It’s that time of year! Just before February and as the current Sentai is starting to end, we get announcements of the next one! The current series is Ressha Sentai Toqger (as seen in the banner), where teenagers with huge imaginations take on shadow monsters with trains as the main gimmick. This time around, a group of ninjas take on the Yokai — evil spirits locked away by the Last Ninja over three generations ago. Now this family of ninjas must honor his legacy by using their Nin Shurikens and becoming the thirty-ninth Super Sentai team! This isn’t the first time we have seen a Ninja theme, but it seems like it could be a cool shift from what ToQger has become. I hope you check your favorite fansub group in February for this new season! Join AkaNinja (Red), AoNinja (Blue), KiNinja (Yellow), ShiroNinja (White), and MomoNinja (Pink) on the 15th of February (or the fourteenth here in the USA, aren’t the time differences great?) for this new sentai team! For more Sentai or other Toku related questions you may have, ask @animeredneck96 on twitter and always check JustUsGeeks.com every Tuesday for the newest news and information about Tokusatsu! Lover of all things Tokusatsu- Power Rangers, Super Sentai, Kamen Rider, and much more. Also a huge fan of country music and Chicago-verse shows. Can always be found at TokuNation.com and on Twitter. Known as Uchi by many on the internet. HENSHIN! Toku Tuesday – Zyuranger Available for Pre-order! 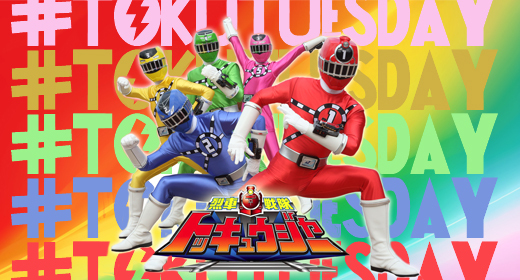 TokuTuesday – Shuriken Sentai Ninninger has premiered!